How to replace a thermostat on the electric water heater fast and easy. Find out how a thermostat works, explore the types, common problems and how to test and troubleshoot it. In short; hot water heater thermostats are adjustable thermostats used to control the temperature of the outgoing hot water. They are surface mounted, installed in a bracket that holds the element against the side of the tank. The back surface of the thermostat is in full contact with the tank, and therefore it responds to tank surface temperature change. On the tank-type heaters, thermostats are located behind the access panels. Every electric water heater has at least one heating element for water heating, one thermostat for temperature control and one high limit switch to protect the unit from excessive temperature. Different hot water temperature is needed for various applications. Hot water is needed for shower, dish-washing, clothes washing... and this is why hot water heater thermostat is used, to set or adjust the temperature. The purpose of the thermostat is to control the electrical current that is sent to another thermostat or heating element when there is a heat change. 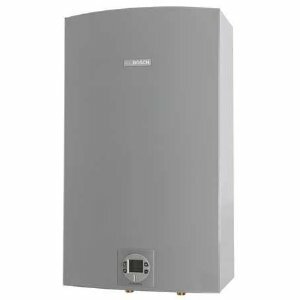 Electric water heaters with the storage tank of 30 and more gallons are mainly equipped with two heating elements and two adjustable thermostats, one on each heating element. The upper thermostat is the main one and has a high limit switch attached. The lower thermostat is the first one that senses a change in water temperature. Upper thermostats are not the same as the lower ones. They also do not operate simultaneously. 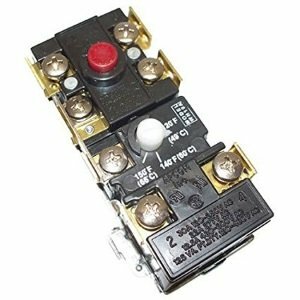 The high limit switch is located in the same area as the upper thermostat, and it has a manually reset (ECO) button that trips when the extremely high water temperature is present (above 170 F). By pressing the ECO button (reset), the unit is ready for normal operation, but if it often trips more investigation should be done. When adjusting the thermostat on a hot water heater, the recommendation is to set both thermostats to almost the same temperature or set the top element to the slightly lower temperature, so the bottom element activates first. 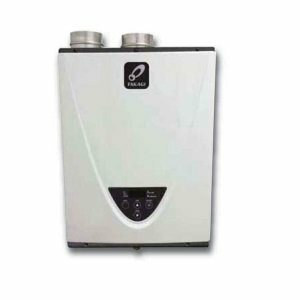 Water heaters with the lower tank capacity and for point of use service utilize only one heating element and one thermostat - usually wired for 120 V. They also have a high limit switch. Water in the tank is cold. The upper thermostat activates, sends the power and 240 V to the upper heating element which heats water. It heats water until the upper thermostat is satisfied. Water is now hot, but only the upper part of the tank. This is good if there is high demand for hot water. However, what is happening with the bottom part of the tank, where water is still cold? As the upper thermostat is satisfied, the power gets redirected to the lower thermostat. Once the bottom heating element gets 240 V, heating starts. As the bottom thermostat is satisfied, power gets interrupted. Now all the water in the tank is hot. If the temperature of hot water gets lower than one set on the thermostat, the heating element will kick in and heat until the thermostat is satisfied or the upper one receives a demand for heating. The temperature range on different brands and water heater models is very similar, and it usually goes from around 100 F to 140 F, and when shipped to the customer units have a factory pre-set temperature of 120 F. This is a safe and energy efficient setting that protect users from scalding water. It is important to know that if exposed to hot water of 120 F it takes more than 5 min. to produce burns, for 130 F less than 30 sec and for temperatures of 160 F less than a second. To change the temperature setting on electric water heaters follow the steps below. Adjusting thermostat on a hot water heater is easy, and you should do it only when the power is off. Disconnect all the power to the water heater on the main switch of the fuse box or the main circuit breaker. Remove the access panel, cover and fold the insulation away from the controls, to clear the way to the controls. Using the screwdriver rotate the adjustment knob to the desired position (temperature). Bring the cover, access panel, and insulation back and turn on the electrical supply and the water heater. Check and replace the upper thermostat if it is defective. If the high limit switch has tripped, manually reset an ECO button. Check and replace the thermostat if it is grounded. Thermostat out of calibration - calibrate if possible, if not replace it. The thermostat was set too low, increase the temperature. Check and replace the malfunctioning lower thermostat, or if improperly wired. Check is the thermostat flush with the tank. If not, make sure it is fully and tightly attaching the water heater. The lower thermostat is defective - replace it. If the thermostat setting is too high, lower the temperature. Make sure the thermostat is flush with the tank. Check if the thermostat is out of calibration and replace it if needed. There are a few ways how to protect you and others from accidental burns. Install temperature limiting valve that attaches to faucets to limit hot water or install a mixing valve to reduce the hot water temperature, by mixing cold and hot water. Testing heating elements and thermostat usually go hand in hand, as some tests are not accurate when the heating element is open or grounded. To perform the test, you need a screwdriver and multi-meter. 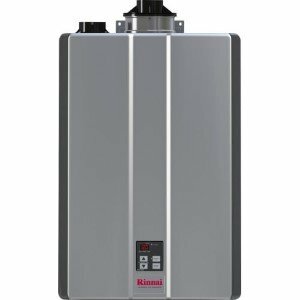 The guide below is for checking Rheem/Ruud electric water heater, and it might apply to other brands as well. Check for power to the water heater on the thermostat terminals. If there is a power, the meter should read 240 V (terminal 1 and 3). If there is no power, check the power supply. Check the power to the high limit switch (terminals 2 and 4). Next, turn the dial on the lower thermostat to its lowest setting so it doesn't activate, and increase the temperature on the upper thermostat, so it kicks in if the water is cold. This procedure is to check the upper thermostat. Check if there is a power between the upper thermostat and heating element by placing the meter prongs on the terminal 1 and blue wire of the heating element. If the meter shows 240 V that means there is a power between them. Repeat the procedure, but instead terminal 1 use terminal 2. If there is no power, the thermostat is broken and should be replaced. Next is to check the lower thermostat. Turn the temperature dial on the upper thermostat to its lowest setting and to its highest on the lower thermostat, so it calls for heat. Put one probe on the terminal 1 and red wire of the lower heating element, the power is being supplied if the reading shows 240 V.
Now put the probes on the terminal 2 and red wire of the lower heating element. If the power is not supplied, the thermostat is defective and should be replaced. Did you know that severe problems can be avoided, if the maintenance and service were performed on time and by a professional plumber. Contact a Pro! Note: fixing thermostat on a water heater is not recommended. This guide applies to both upper and lower thermostat. The new one has to be of the same type and with the same specs. Turn OFF the electric power to the water heater. Remove the front panel door and fold up the insulation pad. Remove the plastic cover over the thermostat. Using the multimeter, check once again is the power OFF. Unclip the thermostat from the bracket. Disconnect wires from the thermostat. Label wires for proper re-connection to the new element. Remove the water heater thermostat. Install the new thermostat into the bracket. Attach wires to the thermostat. Set thermostat to the original temperature setting. Cycle test the heater to check that everything works properly. It is recommended to check, clean or replace the heating elements as well. When bringing the thermostat back, make sure it is firmly attached to the surface of the tank. Inside the access cover, there is a wiring diagram; use it to properly re-connect wires to the thermostat. If your electric water heater is equipped with the two heating elements and two thermostats, the lower ones will operate more frequently, have exposure to the lime build-up and fail more often than the upper ones. When looking for water heater thermostats, it is important to know the voltage of the heating element or water heater. It can be found on the back of the element or the main energy guide label.